Wait, what? Apple Pie with Cheddar and Bacon? Is that right? Oh yes it is! I discussed my love of combining apples with savory ingredients (namely cheddar cheese) the other day, and this time I took it even one step farther. I put bacon on a pie. And cheese in the crust. I'm a rebel like that. When this month's Crazy Cooking Challenge assignment was announced as apple pie, I wasn't sure what I was going to do. I had never made an apple pie before. Adding bacon to desserts was all the rage a short time ago, so I got to wondering if anyone had put bacon in an apple pie. A Google search revealed fewer results than I was expecting. But I did find a recipe that I just HAD to try. It came from The Galley Kitchen, a blog that I am familiar with. I actually used one of Suzanna's recipes for another Crazy Cooking Challenge, in May when we all made grilled cheese sandwiches. I made her Smoky Steakhouse Grilled Cheese Sandwich. That turned out amazingly well, so I had no doubt that her pie would yield the same result. 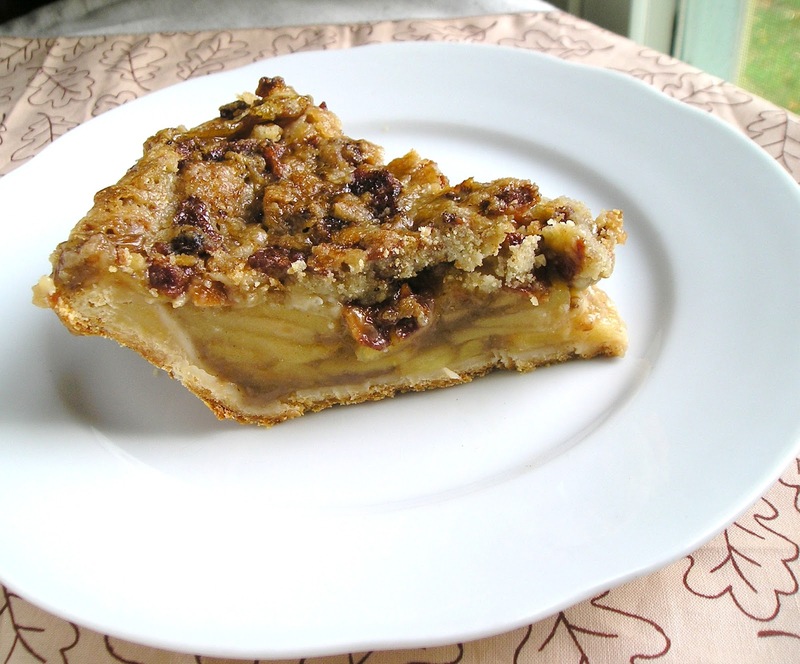 This pie has cheddar cheese in the crust, the perfect apple filling, and a bacon streusel on top that is to die for. This is a salty/sweet lover's dream come true. And it's perfect for those people who complain of desserts being "too sweet". There's nothing like salty bacon to take the sweetness down a notch! Process flour, sugar, and salt in a food processor. Add butter; pulse until pea-size lumps appear. Pulse in cheese. With processor running, add ice water; process just until dough comes together. Turn dough out; gather into a block. Wrap in plastic wrap. Refrigerate until cold, at least 30 minutes or up to 2 days. Dough can be frozen up to 3 weeks. In a large bowl, toss the apple slices with lemon juice and set aside. Pour water into a Dutch oven over medium heat. Combine the sugars, cornstarch, pie spice, and salt. Add to water, stir well, and bring to a boil. Boil for 2 minutes, stirring constantly. Add the apple slices, reduce heat, cover, and simmer until the apples are tender, about 6 to 8 minutes. Cool to room temperature. Put the bacon in a skillet. Sprinkle ¼ cup of the brown sugar over the bacon and cook over medium heat until the sugar is melted and has coated the bacon pieces. Remove from heat and let cool. In a medium bowl, mix together the flour, white sugar, and the remaining ¼ cup brown sugar. Add the butter pieces and mix together with a fork until crumbly. Stir in the bacon bits. Preheat oven to 375°. Remove pie dough from fridge and roll out. Transfer to a 9” deep dish pie plate. Fill with apple filling and top with bacon streusel. Cover tightly with foil and bake for 30 minutes. (Lay a piece of foil on the bottom of the oven underneath the pie to catch any spill-overs.) Uncover and continue baking for 30-35 minutes, until the apples are quite tender and the topping is bubbling and crisp. If the topping is browning too quickly or too much, cover it with foil. Remove from the oven and let cool on a wire rack for 30 minutes before cutting. I know that it looks complicated, but it really isn't. The recipe is broken down into three parts: the crust, the filling and the streusel. Makes it quite simple really. I encourage you to click on these photos so that they blow up to full size on your computer screen. Then I dare you to not drool all over your keyboard! Don't you just want to take a bite? This pie is so massive that it takes a long time to cool down completely. This is what happens when you cut into it while it's still a little warm. Oozy apple-y goodness. If you want nice-looking slices, you will probably have to refrigerate it for a while. I wasn't too impressed with the crust. Well, first of all, I messed it up. I am not a baker, and sure enough, I goofed up the crust big time. I could tell as soon as I rolled it out and laid it into the pan that it wasn't right. It was elastic-y, like pizza dough. While I am no baker, I knew that that was majorly wrong. Pie crust should be flaky, not stretchy. But not having the time or the patience to start over, I went with it. After the pie baked, the crust came out chewy. Gross. I still didn't know where I went wrong. I did have a hard time incorporating all of the cold water, so I assumed that I overworked it trying to get all the water mixed in. It wasn't until I went to type up the recipe that I realized where I had made my mistake. For some reason the crust recipe in the original made two crusts. Why, when the pie only requires one crust? So I decided to halve the crust recipe. I did just fine with that until it came to the water. I realized that I had forgotten to halve the water. So that's why I had trouble incorporating it into the flour and why I then overworked it and it became stretchy. Oops! So the consistency aside, I didn't find the crust very cheesy. Suzanna described it as tasting like a Cheez-It, but mine tasted nothing like that. The cheesy flavor just didn't come out that much. So if I made this pie again, (which would probably only happen if my husband requested it for his birthday or something because, let's face it, this isn't an everyday dessert! ), I would probably just use a store-bought crust. Maybe I would try sprinkling some cheddar cheese on the bottom before adding the filling. About the filling: fancy crust and bacon topping aside, I loved this recipe for the apple filling. The apples were cooked perfectly: not too firm and not too soft. And the gooey part was perfect too, just the right consistency. If I wanted to make a regular apple pie, I would definitely use this filling recipe. But the streusel topping. Oh the streusel topping! Words cannot describe it. Salty and sweet and crunchy. The perfect compliment to the soft apple filling. Just amazing. This is the mother of all apple pies. Or maybe the weird cousin. Either way, it's a force to be reckoned with! I struggle with crusts too. I understand the gooey leftovers in the pan too, it is so hard to not sneak a piece when it looks so delicious! This isn't a combination that crossed my mind...thanks for posting. I was relieved to only half to bake one crust for my recipe, too...yours still looks fantastic! And what great twists on a classic!!! This sounds super yummy! I was originally wanting to do a recipe with cheese but never thought of bacon!! So unique, I love it! I would have never thought of bacon! Looks wonderful! funny idea to mix apples, cheese and bacon in a pie. What an awesome idea! I never would have thought of this flavor combination! I've always loved apples with cheese...love the addition of bacon to the mix! Your pie looks delicious! This sounds soooooo good. Cheddar cheese crust sounds delicious and it's perfect for fall. Thanks for the great recipe and including bacon also. I can't wait to try it. Pretty great post. I simply stumbled upon your weblog and wished to say that I've really loved surfing around your blog posts. After all I will be subscribing to your feed and I am hoping you write again very soon!